Hairdressing competition hosted by Katherine Ryan. In the grand final, the stylists head backstage at a wedding fayre. 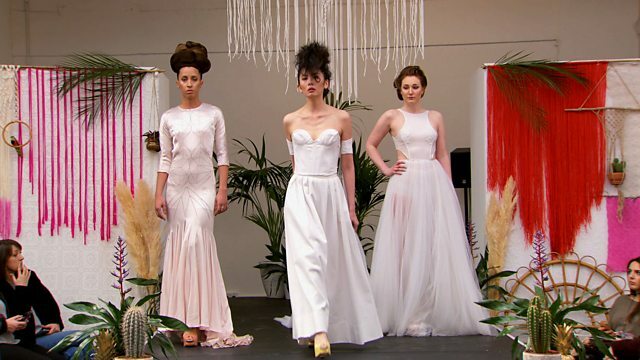 Who will walk down the aisle as the winner of Hair 2015? Hosted by Katherine Ryan. It's the grand final and the three finalists are heading backstage at London's funkiest wedding fayre. First, the have to create avant-garde bridal hairstyles for models taking to the stage in front of the event's 900 invitees. Judges Alain Pichon and Denise McAdam want the stylists to create high-fashion, high-concept bridal hair - they don't want to see delicate braiding so the pressure is on to prove the stylists can think outside of the box. And then it's every hairdresser's fantasy as the stylists must give real brides the wedding day hairdo of their dreams. Who will be walking down the aisle as the winner of Hair 2015?